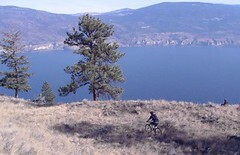 Jay and I enjoyed a stellar ride on Rattlesnake Mountain this morning. He brought a tasty picnic lunch, which we enjoyed on the trail, lounging in the sun and looking over the valley. It took the sting out of the fact that my bike is out of commission again with a blown hub -- luckily Tannis's bike did the trick. Check out Ivy's portrait of Ella from yesterday. Chris suggested that we should frame Ivy's art -- although frames would be a nice touch, he'd probably laugh at our preschool-themed living room. This album from Tegan & Sara is soooooo catchy. It's tonight's soundtrack for a glorious evening at home alone -- Tannis is playing hockey and the girls are sleeping over at Grandma's -- and it's making as happy as Weezer's blue album, Green Day's excellent latest, or my current Webjay playlist. Tannis and I had an unbelievable meal at The Vanilla Pod tonight, almost exactly a year after we visited last time. We shared a few appetizers and an entree so we could sample a bunch of different flavours. The honey-balsamic-roasted potatoes were outrageous, as were the assorted vegetables in a decadent coconut broth. The seafood entree was sole over Thai and basmati rice with a blood-orange salsa. Ridiculously yummy. On the good food and friends theme, last night Bill and Rose made us the most delicious fajitas I've ever had. The night before, Nata hooked us up with some amazing apple crisp (simple, but great) at their place, and on Tuesday Myron and Tracey brought our favourite Yaki's pizzas over. I enjoyed a rare guy's night out yesterday after work, hanging out with blogfriend Chris Corrigan in Kelowna. It was amazing to connect so well with someone I've never met in person -- four and a half hours after meeting him at the Grand, after a few beers, many laughs, one of those great hyperlinked conversations that covers most of the ideas I'm caring about right now, and an entire hockey game...I couldn't believe how quickly the time had passed. It's fascinating to think how well you can get to know someone through their writing. We love Summerland and the Okanagan, but Chris's life on Bowen Island sounds dreamy. Only a 15-minute ferry ride from Vancouver, with a few thousand people, an incredible homeschooling learning network with their own centre, unbelievable physical beauty and a close-knit community. We'll have to find a way down there soon. After the third period ended in a 3-3 tie, I asked Chris for his prediction on the outcome of sudden death overtime. I conservatively predicted that it would stay tied. He thought for a second and said, "Three minutes in, Kelowna scores." As an appropriate end to the evening, the Rockets won the game at 3:05 -- close enough. Ryan sent me this clip (WMP) of a guy who jumps out of a helicopter and sky-dives, skimming over the surface of a mountain with these sort of bat-like extensions on his suit. It defies everything. Greg sent me this virtual tour, skating the Rideau Canal in his new home city. Click "Skate the Canal" to start the Flash movie -- even without the Enya-ish soundtrack, it is quite a moving experience. Almost makes me wish that it wasn't 10 degrees here these days. And finally, Gwen sent me into CBC's ZeD, where I found this super-cheesy-but-ultimately-awesome hacky sack video (Quicktime) from these guys, who also offer amazing free instructional video clips for individual moves. I haven't been taking enough photos lately, but this one of Ivy caught my fancy. She wandered into my office after her nap, all rosy and mellow and asked what I had been listening to. "Green Day", I told her and gave her the headphones. She was mesmerized by the music for about a minute, with those big blue eyes concentrating hard as the melody filled her ears. She's really in a wonderful stage right now -- intensely curious and sensitive and becoming so aware of her self. Ella and I did a sunny hike this weekend up Cartwright Mountain. She was a trooper, hanging out in the backpack for about an hour. We crossed this rocky ridge which yields a great view of our little town. Warning: if you don't want to listen to a proud dad blather about his three-year-old daughter, just skip this post. Actually, you should probably just close this window altogether, come to think of it. Ivy's been on a real tear with her painting this week. She banged out this series of "crazy creatures" while I was washing dishes the other night -- a welcome departure from her usual landscape theme, which is quite nice, but she's repeated this one so many times that it's getting harder to be excited about each one. 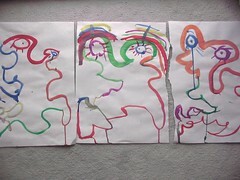 The creatures were inspired by her foray into a colourful undersea scene earlier in the evening. I thought this one from last week was fascinating. It shows Ivy sitting on the toilet in a square room with three pictures on the walls -- all of which are her favourite rainbow, grass and sun combination. Pictures within pictures? She's been working on her writing the last couple of weeks too. She'll ask one of us out of the blue, "if you could be something you're not, what would it be?" Tannis might say "architect", and Ivy will ask how to spell it, then draw each letter (asking us to draw them in the air as a hint when they're ones she doesn't know yet). The results are quite good -- this was a collection of careers we're interested in. Aside from fighting yet another cold (along with my poor virus-besieged family), I've been feeling pretty lucky in the last couple of days. Birthdays usually aren't a big deal for us, but I ended up with three parties, all with feasts I didn't have to make. Ryan and Lezlee brought a killer lasagna over on Thursday night, which we enjoyed with plenty of wine. The girls were pretty amped up, but they generally behaved themselves. Last night my mom made my current favourite dish (Thai wraps with a to-die-for peanut sauce) for the whole crew, along with some cheap (but very nice) Mountain White wine from Hawthorne Mountain Vineyards. Good times. And today, our newest Summerland friends dropped off these amazing (and oh-so-personalized) birthday cookies. What more could I ask for? I found this old photo behind another picture in a frame this week and it it truly classic. 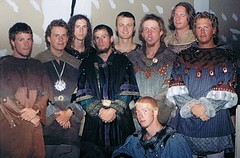 It contains most of my core crew of the early '90s, and somehow the medieval costumes only enhance the characters in this visual. I can't believe I've known these guys for 25 years. Can you tell I'm feeling old and nostalgic this week? A rare pop culture post for me, inspired by this morning's happy moment -- getting a couple of floor tickets to the U2 concert in Vancouver later in April. I'm not as fanatical as some of my U2-loving friends, but I've been a long-time fan and have always said that I'd eventually see them in concert. Metric -- Combat Baby, which I challenge anyone not to fall in love with...beautiful. Engine Down -- Cover, a dark rocker with a great sound and fantastic vocal harmonies. Amon Tobin -- Lighthouse, with the most fascinating, burbling bassline I've ever heard in electronic music. The Hold Steady -- Swish is as close to AC/DC as any new music I've heard, and I mean that in the best possible way. Blonde Redhead - Misery is a Butterfly, a lush, moody ballad with something interesting for everyone. The New Pornographers -- Mass Romantic keeps me coming back for repeated listens...jangly guitars, organ, super vocals with singsong choruses all over the poppy place. The Softies -- Me and the Bees ...you try to find a prettier song anywhere. 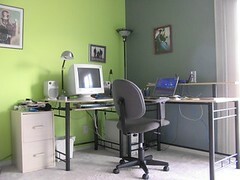 As promised, Tannis brightened up our home office with one wall of the limeiest green that we could find. I take full blame for the potential colour clash, but I think it's great. Happy birthday to me. Last night I was looking back at my entry from my last birthday. We've been in Summerland almost exactly a year now, and it seems surreal that the kids are already another year older. The changes in them are so dramatic compared to my boring leap from 31 to 32. 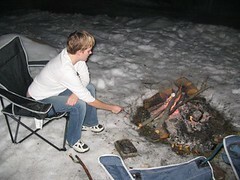 On the weekend we had a bonfire up at Myron and Tracey's, where there was still a surprising amount of snow. Good friends, quality beverages, good kids, good times. Winter bonfires rule, and we even cooked a fabulous supper in camp irons, followed by some smores and an obscene birthday cake. This week has been feeling (and looking) more like March than January or February. I dug my bike out of the crawlspace after a short month off from riding and enjoyed some pristine singletrack, which really felt like cheating. I met a local guy named Ben who was stoked on the kickers on the bottom trail. And finally, a daughter photo: Ivy looking divine at Rose's fancy tea party.